“Playing around with mosaic about 10 years ago I became addicted. Enjoying the process of creating images out of lots of little pieces, I am especially drawn to pattern and flow, as found in ancient Greek and Roman mosaics. 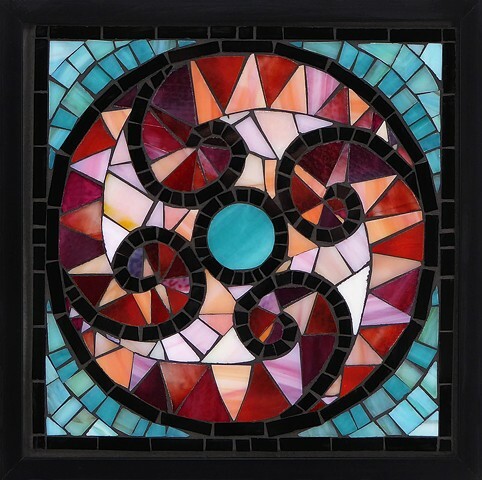 Being captivated by the richness and beauty of the materials I use: stained glass, glazed ceramic, vitreous glass tile, glass smalti, glass beads, vintage glass buttons, stone. I tend to use a lot of color in my work. Gardens, nature and travel inspire me. My work is influenced by the ancient mosaics I have seen, as well as the breathtaking scenery I have stumbled upon around the world.